It’s the time of year to catalogue annual communications, development and policy accomplishments! To guide you going forward in embedding the Building Well-Being Narrative into messaging—with the goal of achieving even more successes in 2019—in this newsletter issue, we offer a practical example with HealthStart Foundation—one of the National Reframing Initiative’s local partners in Austin. HealthStart is improving audiences’ understanding of how its human services meet community needs with effective solutions. HealthStart Foundation has been thoughtful and intentional about applying reframing to its core messaging, including on its website. We take a look at some of its website’s reframed language below. HealthStart continues the construction theme through its mission: “To provide the blueprints for building healthier communities through children’s science-based health education.” Similarly, its Program Overview explains its services are based on its five core tenet approach, again using foundation, materials, tools, building, and communities language to explain how its programs create well-being for all. 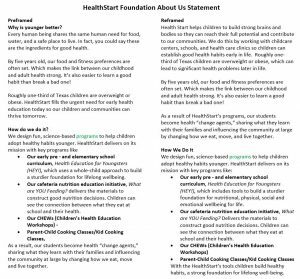 To show a concrete example of how they made the transition, HealthStart generously allowed us to share the below before and after results from their recent reframing of their About Us statement and we explain some of the changes and benefits of the new messages. HealthStart helps children to build strong brains and bodies so they can reach their full potential and contribute to our communities. Early pre – and elementary school curriculum, Health Education for Youngsters (HEY! ), which includes tools to build a sturdier foundation for nutritional, physical, social and emotional wellbeing for life. Removing crisis language (“urgent need”) and eliminating jargon (“whole-child approach”) to keep people engaged and focused on the solutions. We encourage you to submit questions and send your preframed and reframed communications to Bridget Gavaghan, Director of the National Reframing Initiative.